Esri's ArcLogistics Government Grant Program helped jump-start the city's efficient dispatching of crews. With ArcLogistics, lists of nonpaying residences from the Finance Department were used to create an ordered list of stops. GIS helped the City of Woodland refine its fleet scheduling practices and reap dividends in fuel and labor savings. Today's decreasing budgets and volatile gas prices have forced governments to closely evaluate their fleet deployment practices. Even small local government fleets can log enough miles to require routing software to save fuel and vehicle wear and tear. Last year, the City of Woodland, California, concluded that dispatching crews to shut off water for nonpayment of services (one of its most fuel-consuming operations) could be easily improved with an electronic routing system. With a population of 55,000 and relatively small footprint, Woodland has crews that know the pavement well. Since a portion of the work orders entail only single visits to homes (e.g., to turn off water service in a vacated residence), dispatchers don't need to generate routes for those trips. But when Woodland began to notice a steady increase in the number of residents failing to pay for water service, which often required multiple visits per address, improving staff response to water payment delinquency seemed in order. 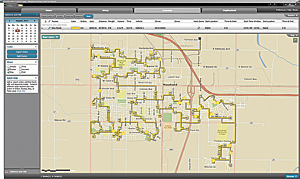 ArcLogistics generates optimized water shutoff routes from simple Excel spreadsheet data. Convinced that geospatial technology could create a better system, Daniel Hewitt, GIS specialist for the City of Woodland, downloaded the unlimited 30-day evaluation version of ArcLogistics. "It wasn't just a matter of turning off the water, mission accomplished," says Hewitt. "Three out of four times, the bill gets paid, and crews must revisit the residence to turn the water back on—sometimes within the same day. 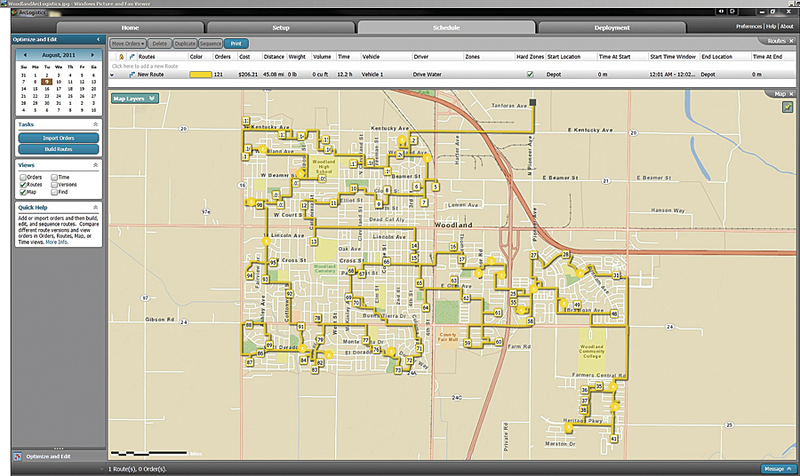 Being a GIS guy, I knew a geography-focused application would help solve this." To respond to water bill nonpayment, the City of Woodland's Finance Department creates driver manifests for its water crews. With so much doubling back, even drivers familiar with the geography of Woodland had no time to think about their lists spatially and logistically. "Our system consisted of nothing more than the finance guys handing crews an Excel file with a randomly organized list of addresses that required shutoff," says Hewitt. "Even with an understanding of the local geography, they could not always respond nearest to farthest, which would obviously make the most sense in terms of vehicle wear and tear and fuel consumption." The evaluation copy of ArcLogistics allowed Hewitt to import the Excel lists of nonpaying residences that the Finance Department generated and create an ordered list of stops. To communicate with the geodatabase, the software requires that Excel spreadsheets have columns denoting city and state. "I added those columns to the spreadsheets so I could feed them into the system," says Hewitt. "From there, the program generated sequenced, turn-by-turn routes for water crews." Hewitt took his findings to Manuel Soto, technology services manager in Woodland's Public Works department, to see if he could get support for the full version of ArcLogistics. Initially, the department questioned whether precise routing in a small city with a staff of mostly Woodland natives was even needed. To address that concern, Hewitt used maps to show that sequencing each stop from nearest to farthest was more critical than the routing. "The main problem we had was lots of unnecessary backtracking," says Soto. But the logistics software created a sequenced order of stops from a simple address list. After clarifying the specific benefit, Soto got approval from the Public Works department to purchase the full subscription. Soon after, Woodland applied for and received a grant from Esri's ArcLogistics Government Grant Program and began officially implementing the solution. Because Woodland had been using the evaluation copy so extensively, the time between installing the full version and making official schedules was short. "We tested it for a while to present the data to the city, so we were already up and running by the time we got the grant," says Soto. "Right now, we just plug in the Finance Department's list of nonpayers and out churns the driver manifests." The new efficiency in creating ordered driver manifests has reduced the number of crews needing to travel. Before acquiring its new routing software, Woodland sent out an average of eight water crew vehicles per day. Today, five vehicles can do the same amount of work. Woodland also found a novel use for its GIS as a bargaining tool for outsourcing. Recently, the city hired a contractor to replace thousands of faulty water meters with more accurate, tamper-proof meters. "Contractors give us a bid on what they think all their driving will add up to in replacing these meters," says Hewitt. "We showed them how sequencing their stops shortens travel, which helps them calculate a more appropriate cost." For more information, contact Daniel Hewitt, GIS specialist, City of Woodland (e-mail: daniel.hewitt@cityofwoodland.org).